KATHMANDU, April 04: Photojournalist Purnima Shrestha is going to climb the Mt.Everest to raise awareness about cervical cancer. “Cervical cancer is a leading cause of cancer deaths for women worldwide. Cervical cancer ranks as the first most frequent cancer among women in Nepal – between 15 and 44 years of age,” she said. She will also be organizing a photo exhibition right from the Everest base camp to the top of the summit to share the happiness of Nepalese women belonging to ethnic groups in different phase of life. “I will be exhibiting about 25 photographs depicting culture and people at work. The exhibition will also be organised at the Camp 3 if there were a favourable weather,” she said at a press conference held on Tuesday to announce her expedition. Shrestha, who has already conquered Mt. Manaslu, is scaling the world’s highest mountain with the theme ‘Awareness on Cervical Cancer’. Shrestha has joined hands with the Karuna Foundation Nepal and Female Cancer Foundation Holland to promote awareness on cervical cancer screening and prevention. Shrestha expedition will begin on 6th April. 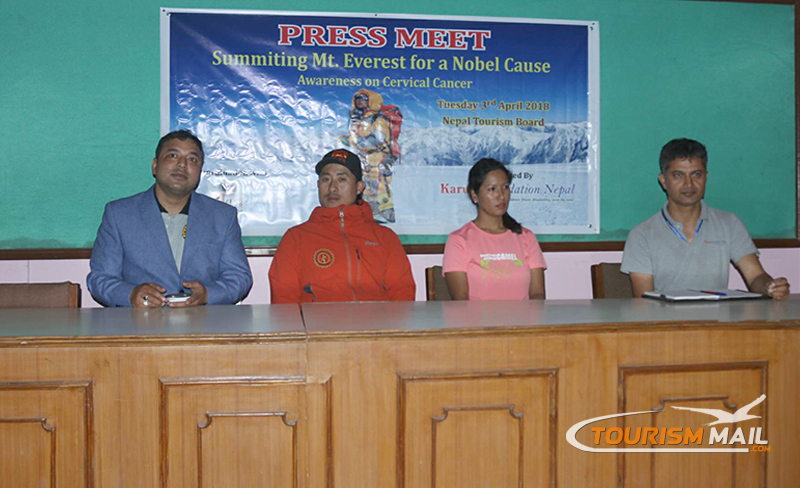 Her expedition has been supported by Photojournalist Club (PJ) of Nepal.